Today, First Aid to Save a Life (FATSAL) Pakistan is honored and satisfied with what they have achieved in year 2011. FATSAL has decided to move to other key cities of Pakistan, to serve local communities and will move in first quarter of 2012 to Multan & Karachi. Multan is the capital of Multan District. It is located in the southern part of the province, Punjab. The city has grown to become an influential political and economical center for the country, with a dry port and excellent transport links. Multan is famous for its crops: wheat, cotton and sugar cane as well as mangoes, citrus and guavas. Multan is a commercial and industrial center, as it is connected with the rest of the country through rail and air including the other industrial hubs such as Lahore, Karachi, Gujranwala, Quetta and Faisalabad. Industries include fertilizer, cosmetics, glass manufacturing, cotton production and processing, large textile units, flour mills, sugar and oil mills and large-scale power generation projects. It is famous for its handicrafts (carpets & ceramics) and cottage industries. Karachi is the largest city, main seaport and the main financial center of Pakistan, as well as the capital of the province of Sindh. It is Pakistan’s premier centre of banking, industry, economic activity and trade and is home to Pakistan’s largest corporations, including those involved in textiles, shipping, automotive industry, entertainment, the arts, fashion, advertising, publishing, software development and medical research. 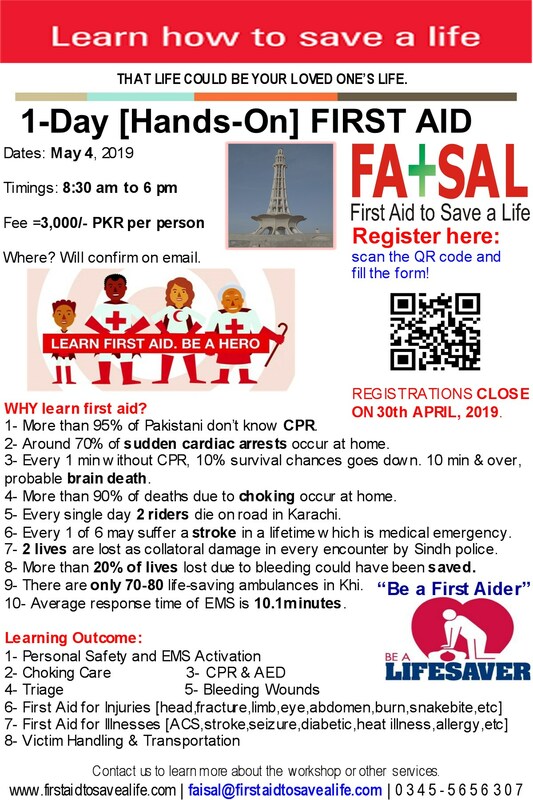 First Aid to Save a Life Pakistan will do best to increase the frequency of courses in Karachi and will try the same for Multan. Why First Aid to Save a Life Pakistan? Why FATSAL charge more for their training courses? This entry was posted in First Aid Training Programs, Industrial News, Why choose First Aid to Save a Life and tagged basic life supporting skills courses in karachi, basic life supporting skills in multan, basic life supporting skills trainings in islamabad, cpr and aed training programs in karachi, Faisalabad, fatsal new plans for multan and karachi, first aid and cpr trainings in karachi, first aid and cpr trainings in multan, first aid cpr and aed trainings in karachi, first aid cpr and aed trainings in multan, first aid trainings in multan, Gujranwala, hse training companies in karachi, hse training companies in multan, Karachi, Lahore, LinkedIn, Multan, ohs training companies in karachi, ohs training companies in multan, ohsas18001 auditing and training companies in karachi, ohsas18001 auditing and training companies in multan, ohsas18001 consultants from karachi, ohsas18001 consultants from multan, ohsas18001 training companies in karachi, ohsas18001 training companies in multan, ohsas18001:2007 training companies in karachi, ohsas18001:2007 training schedules for multan, ohse training companies in karachi, Pakistan, qhse training companies in karachi, qhse training companies in multan, Quetta, skilled and registered training programs from multan, training companies in karachi, training companies in multan, upcoming trainings from multan, upcoming trainings on ohsas18001. Bookmark the permalink. 1 Response to Do you KNOW what is coming in 2012?